Buy All-in-one Brother MFC 210c with CISS with CISS and make 30 times more quality prints for the same money! Pay only 0.04 USD for A-4 full color print! Among all the advantages of All-in-One printers is their size. In this light MFC-210C printer with its dimensions 468 x 370 x 180 mm and its weight 8.5 kg will never upset you, and more than this it will exceed your expectations. You could remember big and heavy fax machines which were used just several years ago! Multifunctional device has one more advantage, that is implied in its name. It is its multifunctionality. You will get all needed functions in one device. It is a multifunctional printer. This device can serve as an inkjet printer or a color photo printer. You could connect it to a wireless network, what will allow you to read memory cards without connection to computer. Beside its printing function, the wireless control over the MFC-210C Brother is applied for flat-bed scanning and independent fax functions, such as digital answerback unit and speaker phone. The Brother MFC 210C has a high level of printing speed. It is more than 27 pages per minute for one-color printing and for multicolor printing it is equal to 22 pages per minute, notwithstanding that its class-mates Brother MFC-5460CN and Brother MFC-J415W has better printing speed. It has rather slow color photo printing and its maximum printing resolution is 6000 x 1200 dpi. The users will be disappointed with the quality of photo printing, because they lack of some tints in comparison with other autonomous photo printers. The automatic paper feeder of the device keeps 20 photo paper sheets. Due to its 2.5-inch LC color display, which is chiefly designed to review images, and a built-in Multi-Card Reader, you could printe documents and photos from memory cards directly, as well as from cameras via PictBridge connector. Moreover, this display allows you to deal with menu options. The telephone functions of the device will satisfy all the demands of small or medium offices. The fax, which can process up to 10 sheets, and modem have 14400 operation rates. The fax is autonomous, that is why you will not need to start computer to accomplish the functions. The telephone has a built-in digital answerback unit, 80 slots for number quick dialing and a bidirectional speakerphone. This possibilities enables both sides to avoid the necessity of using a receiver. The Brother printer MFC-210C is a good choice for performing all the other medium office functions. You should pay attention to the operation of its copier. It could provide document enlargement or reduction from 25 to 400% with 1% scale spacing. The scanner apart from its scanning abilities could also send images to e-mail, OCR or print with maximum interpolative resolution of 19200 dpi (600 x 2400 dpi without interpolation). Many Users have already had the possibility to appraise its multifunctionality in such cities as New York, Washington, Boston, Detroit, Chicago and they have opted for this inject printer to perform their everyday office work. The Brother MFC-210C wireless inkjet all-in-one printer has improved color cartridges. 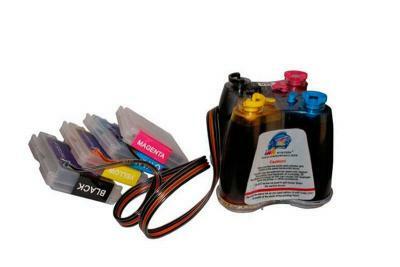 The every ink unit consist of four different color ink tanks, which are connected. When you run out of ink, you will able to remove the tank from the printer easily and replace it with a new one. Now you do not have to change the whole cartridge with unspent inks, if only one of them is over. Due to this factor you will decrease ink expenses and save money. One black cartridge is able to print up to 500 pages with 5% filling, and with yellow, blue and purple cartridge you can print 400 pages with the same filling. Minimum Paper Width/Length (Paper Tray)	3.5"/5"
Sheet Weight - Paper Tray (max/min)	17-48 lbs. Carton Dimensions (W"xD"xH")	16.5" x 7.9" x 15.0"
Carton Weight (lbs)	14.5 lbs. Unit Dimensions (W"xD"xH")	14.7" x 15.7" x 5.3"
Unit Weight (lbs)	12.1 lbs.